Most expecting moms and party guests go wild for a jungle theme baby shower. Hostesses can have so much fun with all those bright colors of greens, browns and oranges not to mention all that yummy yum food. We have game ideas to let your guests roar with excitement and when they leave they will be buzzing with the news of how impressed they were. After deciding on a party theme the next step is to let the mom-to-be's friends and family know she is having a jungle theme baby shower. There are many FREE and for sale jungle invitations online and at your local party store. You can even make your own if you are up to it. Just get some cute animal cliparts and your craft paper and start creating. 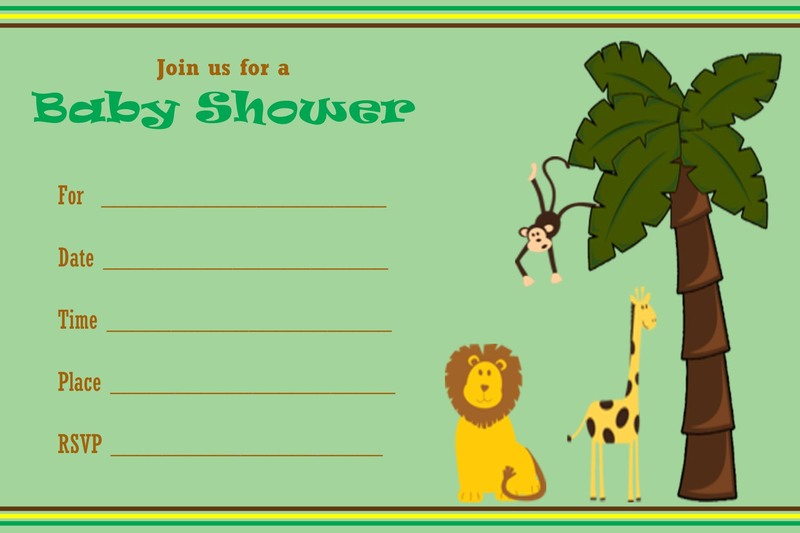 Below you will find some jungle baby shower poems to use in invites or just to get some inspiration to make your own. We also made a couple free invites for you to enjoy as well. The clothespin game is popular especially with a large party crowd since it allows guests the opportunity to mingle and just be silly even with strangers and acquaintances. You will need to get some green clothespins and hand 1 to each guest on arrival. If anyone says the word baby then they forfeit their clothespin. The person left with the most clothespin at the end of nearing the end of the shower wins a prize. A fun and not so easy to win game to play is guess how many green jelly beans are in the jar. Using whatever clear jar you have so guests can have a good look at the jelly beans inside. You simply make a note of how many jelly beans you have in the jar and place a sheet of paper and pen available for persons to write down their names and their guess. The person that guesses the exact amount or the closest without going over wins a prize. With all the jelly beans being green. It will not be so easy to guess the amount. It can be used as a nice table decoration until you are ready to play. There are a lot of baby shower decoration online and in stores that are pretty inexpensive which includes, banner, table clothe, cups, napkins plates and so on. Use cut-outs of trees and jungle animals such as monkeys, lions, giraffes, elephants to put on walls and table. Get pictures from books, magazines or download pictures online and print on cardstock. A nice idea is to use vines and big leaf plants to really get a jungle feel around the room. Use real fruit on the tables to help with the atmosphere such as bunches of bananas, pineapple and even fruit platters which are not only decorative but delicious as well. Fruit salad with pineapples, bananas and other fruits. A nice idea is to place fruit in cups so everyone can just grab and go.